Get your tickets click here! 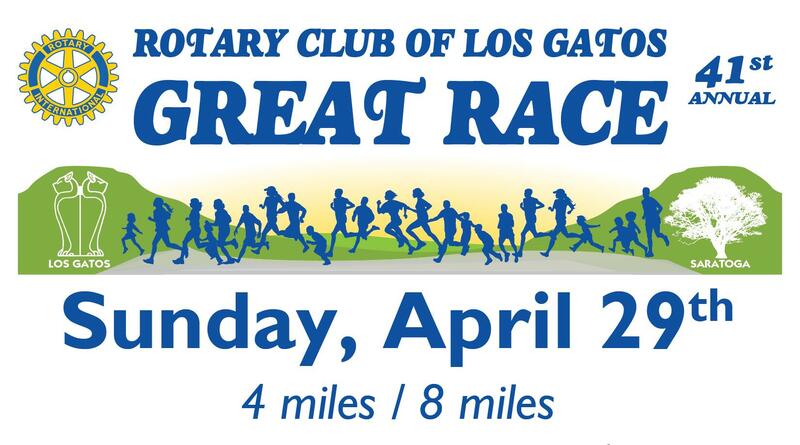 The Rotary Club of Los Gatos presents the 41st Annual Great Race, a scenic footrace/walk from Saratoga to Los Gatos. Since 1978 this community event has taken participants from the South Bay and beyond 4-miles down Highway 9 from Big Basin Way in Saratoga to N. Santa Cruz Ave. in Los Gatos. For the first time ever, for those who hate shuttles or prefer a longer distance, we will offer the Gr8er Race, an 8-mile option that will begin in Los Gatos, head up to Saratoga, turn around and return to Los Gatos. This is an extended version of the early years of the race in which runners could begin the race in either Los Gatos or Saratoga. Please note the new start time of 8:30AM. Also new this year is complimentary access to photos taken at the event by professional photographers. You will be able to download- at no cost- all individual and group photos and shots of you breaking away from the pack! Keep those cell phones in your pocket and let a professional take photos this year. This is a $20-$50 option at most races that is included to enhance your race experience. The event is great for runners, joggers, walkers and families. Special rate for kids 12 and under in the 4-mile event. Proceeds support Rotary's youth and community projects. ONLINE REGISTRATION CLOSES AT NOON ON FRIDAY, APRIL 27. In-person registration is available on race day from 6:30-8:00AM in Saratoga and Los Gatos.